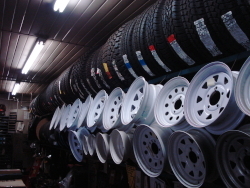 Tires and rims in stock for all sized trucks, trailers (large and small), and RVs. Construction equipment tires, wheels, and service also available. All services are offered in shop and on the road. 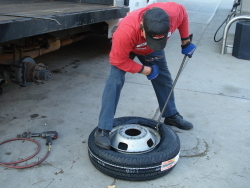 We also offer wheel balancing, tire repairs, valves, as well as other related supplies, which are all in stock. Commericial tire banking for use in Pittsburgh is available (tires locked in racks for your vehicles only). Call for details.